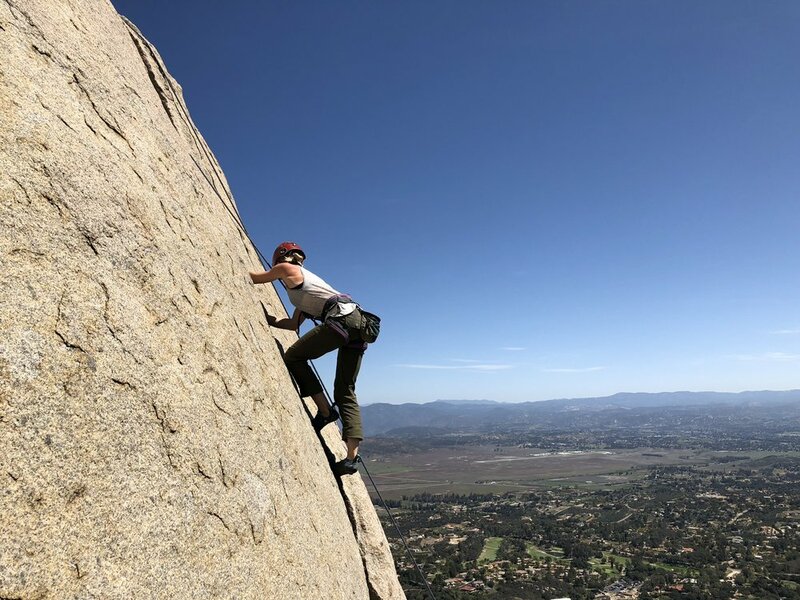 Golden State Guiding is pleased to announce we will be hosting 4 Remote Wilderness Medicine Courses in 2019 with our partner and provider MED Alliance and Vertical Hold Climbing Gym. If you are an avid backcountry traveler or simply enjoy getting out every weekend to hike some of your favorite local trails, then a wilderness medicine course is for you! Being trained and capable to stabilize a patient and facilitate an emergency rescue/ evacuation when you are within an hour or more from definitive help is a key skill every outdoor enthusiast should possess. Educate yourself, get the training, and be prepared. 2019 course dates are below. Looking forward to a year of education in Remote Wilderness Medicine! We just wrapped up another Gym 2 Crag series for the month of July and had nothing but happy participants at the end of the course! Knots and Hitches, Top Rope Anchors and Rappelling skills were taught throughout the 3 weeks at our partner gym Vertical Hold then we took it to our local crag, Mission Gorge, where our students put their newly acquired skills to the test! Big thanks to everyone who attended the G2C for the month of July we couldn't be more pleased with your success! Also, big thanks to our newest apprentice Scott Iwamoto for helping facilitate the day out! Another round of our Advanced Gym 2 Crag just wrapped in Joshua Tree, NP and what a great day out it was! All our participants built multiple Joshua Tree Anchors then rappelled into our climbs using their own anchors. From there we placed gear on mock leads, explained the fundamentals of gear placements and spoke to scenarios they may encounter when on the wall. All of our participants did a great job, we couldn't more pleased. Looking forward to our next round of the Advanced Gym 2 Crag program coming up in June! Well the first ever Ladies Weekend Out event with Golden State Guiding is in the bag and what a success it was! We were blessed with an amazing group of talented women who came to the event ready to climb, learn and have a great time! Education was at the forefront of the weekend and all of our Ladies soaked up the knowledge our certified AMGA guides had to offer. Sport anchors were built, rappelling lessons facilitated, gear placement and anchor demonstrations provided and of course the ever so popular tape gloves were put into action because our Ladies got on some crack! The #Sladies were out in full force this weekend and really took home some great memories! Big thanks to everyone who came out for the first ever Ladies Weekend Out event with Golden State Guiding! It was an amazing event and we couldn't be more pleased with the outcome! A special thanks goes out to GSG's head Guide for the weekend Lauren Breitenbachfor facilitating an amazing event. Big thanks to GSG Guide Tyler Dandurandfor helping out throughout the weekend and to GSG's newest apprentice/ SPI Aspirant Sarah Barille for keeping the girls safe and running her own lessons with the participants. Also, a large shoutout goes out to Oliver Dela Cruz for filming the entire weekend and to Margaret Chiu, Vertical Hold Instructor, for working with the Ladies on technique and movement both days, we couldn't have done it without any of these talented individuals. And last but not least, a HUGE thanks to all our partners who supported this event, Aret Basewear, Saint Archer, Riot Cake Co., Vertical Hold Climbing Gym, Evolv, Shelta Hats, American Alpine Club, and prAna. The girls were given their goody bags at our party at Saint Archer Brewery Saturday night and they were beyond stoked to say the least, thanks for your support! Keep an eye out for the next Ladies Weekend Out event this Fall 2018! We just finished up with our first round of the Advanced Gym 2 Crag series for 2018 and we couldn't be more pleased with the outcome! Participants learned to place gear and build advanced anchors in a controlled environment then took their newly acquired skills to the outdoors in Joshua Tree for a fun day of mock leads with gear, anchor building with static lines and of course some fun climbing! Nothings more satisfying then watching our students grow their toolboxes and begin to feel more confident in their abilities. Great job to everyone who participated in the first AG2C course of 2018! Keep up the good work! Golden State Guiding has teamed up with Aret Basewear and Saint Archer Brewery for another fun weekend of climbing at our local crags! Ladies Weekend Out will be the weekend of April 7th and 8th at our local climbing spots, Mission Gorge and Mt. Woodson. Saturday night we'll have a party at Saint Archer Brewery where we'll be playing climbing movies, enjoying some tasty craft beers and indulging in some tasty deserts from Riot Cake Co.! Click the image below for more info and to register for the event. It's going to be a great time! Additional support comes from San Diego chapter AAC, prAna, Evolv, Vertical Hold, Riot Cake Co. and Shelta Hats. The first round of participants of 2018 for the Gym 2 Crag program finished up their course this past weekend at the local crag Mission Gorge. Temps were perfect, stoke was high and everyone left the program feeling confident in their knots and hitches, anchor systems, rappelling practices and overall climbing abilities. BIG thanks to everyone who came out and kicked off the year with us, we couldn't be more pleased with your progress! Special thanks to our partner Vertical Hold Climbing Gym and GSG guides Tyler Dandurand, Lauren Breitenbach and Tim Sweet for making this a success. Looking forward to starting up our Advanced Gym 2 Crag next month! Stay tuned! New to climbing and want to learn how to safely and efficiently build Top Rope Anchors for climbing outdoors? Drop by the Vertical Hold Poway location tonight from 7:30 - 9:30 for our Top Rope Anchor clinic!